Walk-it Willow is available for the USA from Amazon here. The books are really well made and the illustrations are fab. Both of my boys (aged 7 and 10) were able to read them themselves but also enjoyed it when I read them as their bedtime story. We split the book over two nights, it would have probably been better over three or four nights but they were desperate to know what happened so we kept reading for longer than usual! I think these books have given the boys a real boost with their confidence. Riley doesn’t struggle as much but Leo can become quite easily defeated by things and tends to give up when challenged. The way the characters in the books tackle the problems they face is fantastic and helps children to understand they can find different ways of doing things and to keep trying. Great inspiration for young kids!!! I loved the messages of organisation and teamwork in this book. Subtle, yet enough to inspire an 8 year old! This book sparked great discussions about responsibility, a concept that can be really hard for children to understand and also got them thinking about what to do if things do start to go wrong and they are worrying about admitting their mistakes. This book lays out the idea of responsibility and what it means to be responsible in a really clear and easy to understand way. I appreciated that Willow tried hard to be responsible, but made a mistake as this is so easy for children to do when they are excited about starting something new. The book talks about the importance of being organised and asking for help if you need it. A lot of the children in my class love animal books, so the fact that this one had dogs in was a big hit! As a parent of a impressionable 7 year old, I was really pleased to be able to give her these books to read. Being a fluent reader, she’s more than capable of reading these books alone, which she did. What I love the most about all of the books is that to adults, the messages are quite obvious but to the target audience, the messages are perhaps less obvious. Yet, the messages still get very much absorbed and in my opinion, these stores are therefore as inspirational as they aim to be. My favourite out of the set of 3 (and our 7 year old’s favourite too!) is Walk-it Willow. The message encourages the reader to think about and create opportunities for themselves, which I really loved as my eldest Clayton is a little obsessed with pocket money right now. To spark his little imagination about how he could possibly create more money from his actions is an exciting prospect for him. The books were thoroughly enjoyed by my 7 year old. As we discussed the books once they were finished he made note of their ability to solve problems, and in a calm and logical way, may I add. I particularly enjoyed that Walk It Willow used her initiative to take something she enjoyed (walking dogs) and turned it into her own little business. An essential lesson for us all. Follow your passions and work out how to turn that into a service people want to use. Great. Best book ever hope to read loads more especially like the illustration of Mr Moore (he is my dad !) Code-it Cody is going to be great too. Full of key messages. As a parent and life coach for children I found this book to be easy to read and full of lovely messages that children can take from it. It touched on taking responsibility, problem solving, admitting mistakes and also the work it takes to run a small business. Willow is entertaining but very human. A lovely story that I will now share with my youngest son. Wonderful Willow A charming book, wonderfully written and illustrated ! After reading about Willow and stomp, you feel as if they are somehow connected to your own life stories, especially washing the reluctant dog !! Thoroughly recommend this book. A pleasure to read to the children. My 8 year old loved it! What a fabulous book!! my 8 year old loved it! it's not easy for me to get him to read but he actually wanted to read this book. he loved the characters and laughed out loud at the funny parts but then tried to help willow with her problem. blissfully unaware of the fact that he was learning too. i have never known my boy get so engrossed in a book. i have recommended this set of 3 books to all of my friends they're brilliant! A fun and inventive way of teaching children key life lessons. I bought Walk-it Willow for my younger brother to encourage him to read more. He loved the story and couldn't wait to read it each night, enjoying the detailed illustrations and learning more about Stomp and his canine friends. The book was incredibly inspiring and it was interesting to see how the story opened his mind towards thinking more responsibly about money and the value of hard work. He can't wait to follow in Willow's footsteps now and has begun thinking of fun ways he could earn his own pocket money, as he eagerly awaits the next book in the series. I would definitely recommend this book to others with little ones between the ages of 6 - 11 years old. A great introduction to enterprise for young children in a fun, accessible way. 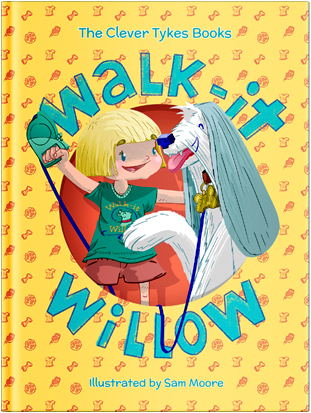 I bought Walk-it Willow to read with my 7 year old son. It was a great read (for both of us) with simple but fun illustrations, short chapters, and a fab role model in the form of the young girl Willow. Some of the vocabulary used might be a little challenging for the younger end of the 6-11 age range, but I think it's a great book to read together anyway as it certainly stimulates plenty of discussion. Touching on some of the basic skills (communication, and problem solving, as well as values such as honesty) in a fun, accessible way, the book also fundamentally introduces children to the idea of a work ethic and how with determination, hard work, taking a little responsibility, and doing a little bit of planning, things can work out well. I, and my son, are looking forward to the next book in the series and many more to come! Well done Clever Tykes. An inspiring book for ambitious children! I downloaded this book to read to my daughter, who absolutely loved the character Willow and her canine co-star Stomp. The story really got her thinking of ways in which she could earn a little bit more pocket money and the illustrations showed that it could be fun too! I think it's really important to teach our children the value of hard-work and the rewards that come with it in these economic times, and this book does that wonderfully. Looking forward to seeing more books from this series in the future. 5 Stars! 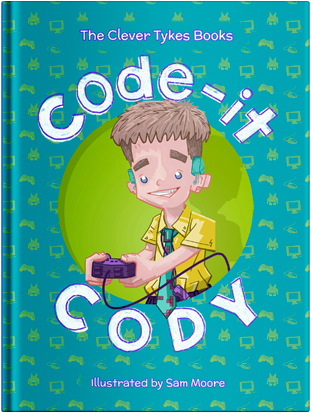 Code-it Cody is available for the USA from Amazon here. A good way of introducing children to the idea of coding. They get very excited when we start working on Scratch, but a lot of them don’t realise the hard work that goes into coding and into creating a new game. In a similar vein to the other books, Cody is faced with challenges but he perseveres and works hard enabling to overcome his fears and achieve his goals. This is all presented in a fun and engaging way throughout the book with lovely cartoon illustrations (well done Sam Moore!) that the children loved looking at. We read three of the books and enjoyed every one. My personal favourite was the one about healthy eating (I am a bit of a stickler for it) but the boys picked Code It Cody as theirs. They both love computers and Leo has recently started learning about coding. I loved the fact that Clever Tykes use characters from the diverse world we live in – Cody has a hearing aid. Living with a disabled mum, the boys never see this as a big deal but for some children who haven’t come across disability, this will be a great introduction to it. I think these books have given the boys a real boost with their confidence. Riley doesn’t struggle as much but Leo can become quite easily defeated by things and tends to give up when challenged. The way the characters in the books tackle the problems they face is fantastic and helps children to understand they can find different ways of doing things and to keep trying. Get your kids excited about coding. The perfect book to spark an interest in coding and all things tech. The first thing that I really appreciated about this book is the fact that the main character, Cody, has got hearing aids. 2 children in my class last year had hearing aids, and I know they would love to see a character with hearing aids like themselves in a book. It is also a good way of introducing children to the idea of coding. They get very excited when we start working on Scratch, but a lot of them don’t realise the hard work that goes into coding and into creating a new game. In a similar vein to the other books, Cody is faced with challenges but he perseveres and works hard enabling to overcome his fears and achieve his goals. This is all presented in a fun and engaging way throughout the book with lovely cartoon illustrations (well done Sam Moore!) that the children loved looking at. We've all recently read Code-it Cody and all enjoyed the experience. It really gives an added dimension to learning. The concept of us all being different but equal resonated with me which I embedded in the children. I think it's really important to respect and value people regardless of how they may appear, their beliefs, etc. I love Cody's compassion and how he happily accepts his limits (e.g. being hearing impaired) but looks beyond it and doesn't allow it to hinder his passion for computers. The children found it very relatable. My eldest has become quite the coding geek since reading it. He's teaching my six year old different projects using Scratch. But what was so wonderful was the message of trusting our children. When they enjoy something they thrive, gain skills and confidence. They can find something they love and make it their living as opposed to being in work that’s stressful and unenjoyable. Definitely think Clever Tykes would really open the minds of education! My seven year old daughter really liked the book and we had good discussions about it. Cody himself wears hearing aids. This was interesting for my daughter because she has two children in her class with hearing aids and it gave her a chance to talk about it and see how it didn’t hold the child in the book back from what he wanted to do. She was bubbling with ideas for her own business after reading the book and I feel more empowered now as a parent to help talk her through them rather than try and talk her down from her ideas because I am scared she’ll be disappointed. As a parent and a teacher you want to encourage children to follow their dreams and also help equip them with the steps to actually achieve them. After reading The Clever Tykes stories to my son I feel that the stories can help encourage and inspire him to be creative, brave and innovative. His favourite book was Code-it Cody and I can honestly say that he has been losing interest in bedtime stories for the last year and would rather cuddle and chat. This wasn't the case when I read these books and he didn't want me to stop until the story had finished, this took me a good half an hour and I was surprised how well he listened. Finally a book my child will read on his own! Buddy likes the way that they are written and the text is really easy to read, so he has actually been reading these on his own in his bed. He says he likes the way it’s on white paper as he can clearly see all of the words. Plus point for the publishers there! I think it’s wonderful that the stories are written in such a way that a child who is a little adverse to reading is choosing them over other things we have in the house – this is great news. It makes me very happy, as you can imagine! A great way to foster your child's entrepreneurial spirit. This was the first book I read in the Clever Tykes series, which I read to my son who is just four. He enjoyed hearing about Cody and asked a lot of questions about code and making video games! He is excited about when he might start learning code at school (he hasn't started yet!) and it reinforced the idea that people can make money doing what they love (we talk about this a lot as I love my freelance work). If you want to foster your child's entrepreneurial spirit, then I highly recommend these books! Well done to all the people involved in these amazing books. I didn't have to nag my 8 year old to read whilst reading this book. He enjoyed meeting cody and his friends and every night happily read more. As the characters learned valuable lessons my son also went on that journey with the book, as we discussed what we would do if we were Cody. I recommend the complete set of these books, it's so easy for the children to get involved with the book & un-knowingly learn valuable life skills. Solving problems is hard to teach. 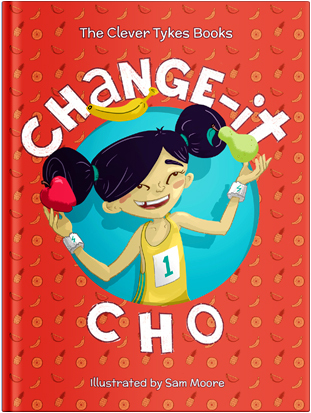 Change-it Cho is available for the USA from Amazon here. This book links brilliantly well with the idea of Growth Mindset and perseverance. Cho doesn’t give up, even when things don’t go to plan and adults talk down to her for being a child. She stops and takes the time to think about what she could do differently to achieve her goals. This sparked some excellent discussions with children telling me about goals they would like to achieve and what their plan is to achieve them. This one was definitely a hit, the children liked seeing a strong, female lead who put her mind to something and achieved her goals. I think these books have given the boys a real boost with their confidence. Riley doesn’t struggle as much but Leo can become quite easily defeated by things and tends to give up when challenged. The way the characters in the books tackle the problems they face is fantastic and helps children to understand they can find different ways of doing things and to keep trying. Both boys were full of their own ideas when reading the books – giving me things that they thought they could do, ideas on computer games they would like to invent and Riley enjoyed telling me about his current topic at school which was healthy eating when we read Change It Cho. Cho is an inspiration! Important topics covered here, healthy eating, confidence and how to make a real difference. Go Cho! This book links brilliantly well with the idea of Growth Mindset and perseverance. Cho doesn’t give up, even when things don’t go to plan and adults talk down to her for being a child. She stops and takes the time to think about what she could do differently to achieve her goals. This sparked some excellent discussions with children telling me about goals they would like to achieve and what their plan is to achieve them. This one was definitely a hit, the children liked seeing a strong, female lead who put her mind to something and achieved her goals and it linked perfectly with our discussions on healthy eating in science and the start of our monthly mile. Personally I think these books are fantastic. Eva’s attitude has changed since reading the books. She has started putting a lot more effort into everything. Challenges no longer end in tears since Eva read the Clever Tykes books. Eva is stopping to think of ways she can solve problems rather than getting upset & feeling defeated. Definitely a sign the books have helped instil positive enterprising behaviour. Eva read the Clever Tykes Change It Cho book first and quickly flew through it with plenty of smiles! Once she had read it I asked Eva what she thought. She really enjoyed the book and reading how Cho decides to change how much junk food kids eat. Cho starts raising awareness but faces several challenges along the way. Eva said her favourite part in the book is when Cho stands up in assembly in front of other children to tell them about healthy eating. Brilliant idea! Children learn and get inspired by people around them, whether they’re physically there and real like parents, teachers and friends or fictional characters from TV, films and books. Using stories like these to promote important life skills and characteristics in children and giving them the inspiration and empowerment they need to believe in themselves and their future is such a brilliant idea. The next generation will be a very entrepreneurial one! Another great title from Clever Tykes - I recommend reading all three! The best modern storybooks to inspire children to be positive, resourceful and enterprising. The Clever Tykes books promote important values through morals and role models. Perfect fiction for children ages seven, eight and nine for bedtime reading, home learning and character building.